Libro Castro, a fundraising dinner to support Castro Adobe State Historic Park, was a big success thanks to our sponsors, donors, event attendees, as well as the many volunteers, Friends staff and State Parks staff who help make this event possible! 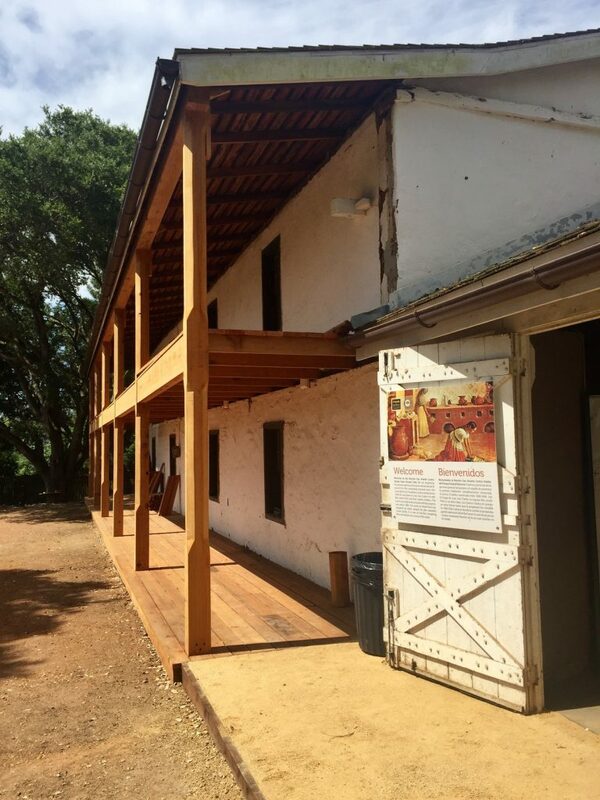 At the event, we launched The Castro Adobe in the Twentieth Century From Earthquake to Earthquake By Suzanne Paizis New and Updated into the Twenty-First Century by Friends of Santa Cruz State Parks. 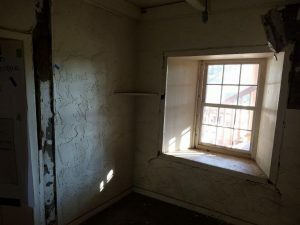 In the second edition, nine new chapters pick up after the Loma Prieta Earthquake to tell the unlikely story of how a grand old adobe, fallen on hard times, is being reborn as the Castro Adobe State Historic Park with help from Friends of Santa Cruz State Parks, California State Parks and a community of passionate grass supporters. The book is available for purchase at our five ParkStore locations, Kelly’s Books and Bookshop Santa Cruz as well as our online store. 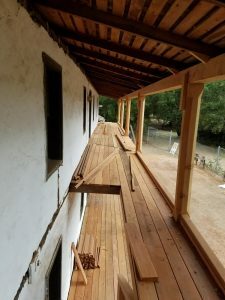 Come visit the Castro Adobe State Historic Park during a monthly open house event and see the progress of restoring the adobe and creating a new State Park. 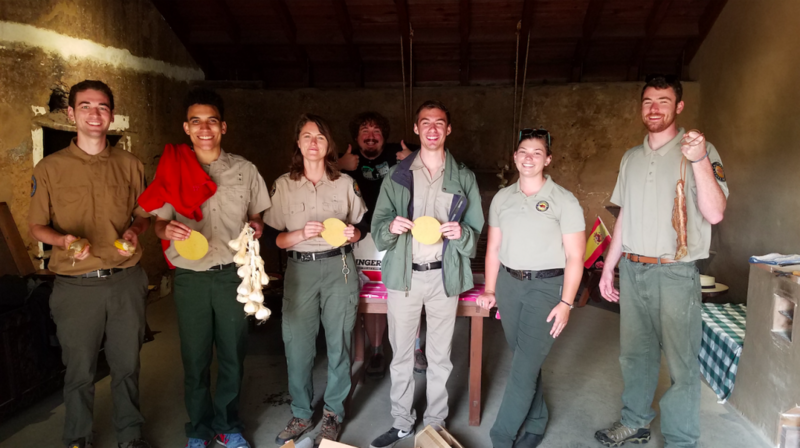 Six college interns are working in the Santa Cruz District of California State Parks this summer. The group meets Tuesdays to learn about one type of State Parks job. The interns have done a habitat restoration with Google volunteers and the State Parks resources team, they went on an exciting ride-along with the lifeguards, and they learned about ranger careers and got to see one of the brand new ranger vehicles with all its sirens and lights. They also visited the district office and learned about administrative careers. 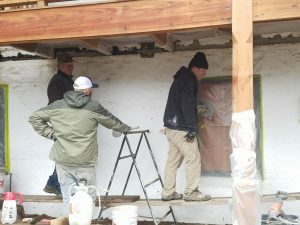 In this photo they are working on a cultural history project at the Castro Adobe where they helped install the replica food items in the cocina. The interns are Graham Felbrugge from Cabrillo College, Tyrus Borowski from SF State, Bella Kressman from UC Santa Cruz, Sam Roberts from UC Riverside, Jon Bol from University of Nevada-Reno and Ben Dorfman from UC Santa Cruz. The exterior stainless steel cable has been installed around the center of the adobe building, concluding the seismic work at the site. 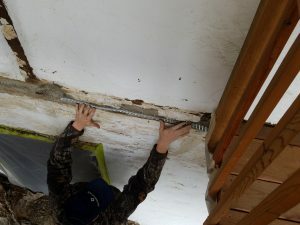 The cable connects to the interior floor joists by way of a bracket and eye bolt. The cable is then threaded through the eye bolt and is anchored into the wall. Plaster contractor Chris Ingram Lath & Plaster, use lime plaster to fill in the void and metal mesh is then installed. Eventually the wall will be whitewashed to conceal the cable install area. 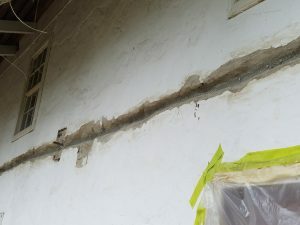 With the install of the cable, all of the seismic work is officially done at the Castro Adobe! The crew carefully works on installing the cable and filling in the void. Mesh is installed over the cable. Mesh installed on the west side of the building. 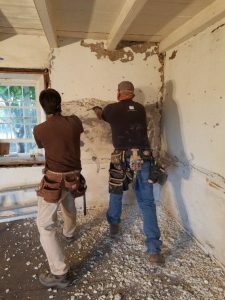 The first steps to restoring the interior of the Castro Adobe began when the stucco netting (stucco and chicken wire), which had encased the historic adobe walls since the 1960s, was carefully removed. 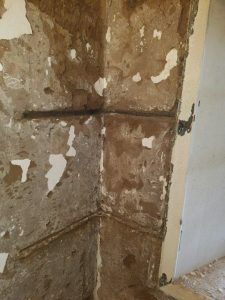 The removal of the stucco netting exposed the historic walls and finishes, a bit of additional historic graffiti, and evidence of an original shelf in the northeast wall of Room 104. 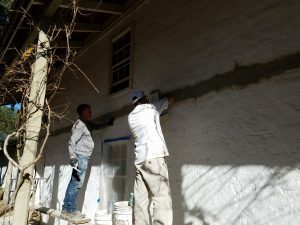 Contractor Brian Bogaard and his assistant remove the stucco netting from the west wall. An original shelf, which had been demolished to accommodate the application of the stucco netting, was exposed. This corner shelf will be restored. Northeast corner before removal of stucco netting. 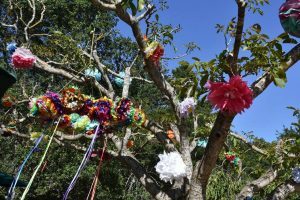 We appreciate the generous support of Boho Castro, a Bohemian-style fundraiser for the Castro Adobe, held Saturday, June 10 at Castro Adobe State Historic Park. 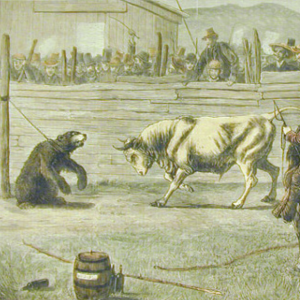 This event is a fundraiser to support the opening of Castro Adobe State Historic Park. 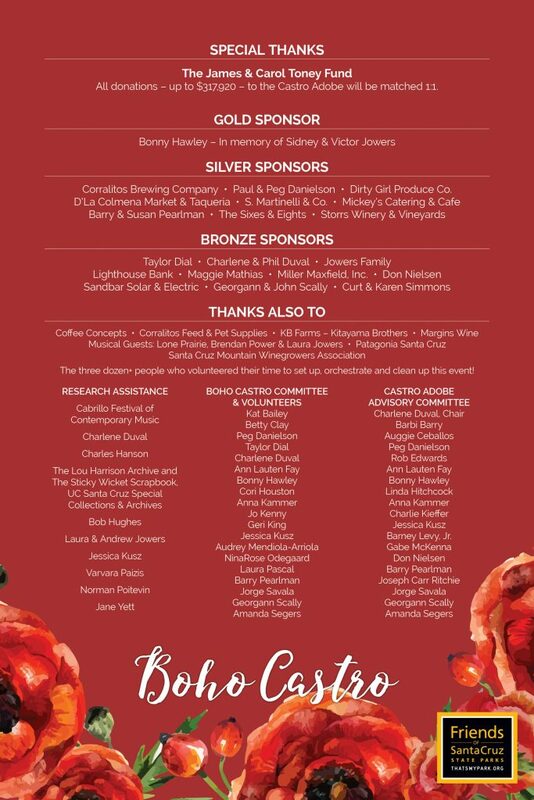 The following sponsors and supporters have helped make this event possible. Thank you! 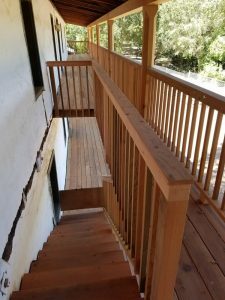 The accessible pathway in front of the cocina has just been extended to meet the beautiful, newly built redwood boardwalk. The Jowers, Castro Adobe stewards (1963-68), owned and lived in the Castro Adobe during the Bohemian era of the 1960s. The Jowers also were the proprietors of the avante-garde Sticky Wicket restaurant in Aptos, a center for Santa Cruz County’s artistic community. 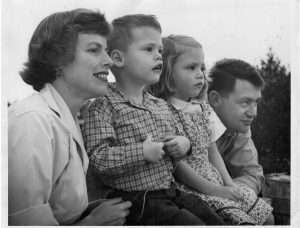 The Jowers were instrumental in establishing the Cabrillo Festival of Contemporary Music and even held early fundraising events for the festival at the Castro Adobe. Victor and Sidney Jowers led remarkable lives, part of them at the Castro Adobe. Victor – reporter, restaurateur, Londoner – and Sidney – author, costume designer, New Yorker – loved the Old Adobe, as everyone called it in the 1960s. It was Victor’s home when he died at 39; it was the home Sidney left soon after when she moved with her two children to England, there to stay. For them, the Adobe was a celebration of culture, history and family, of the arts and of life. 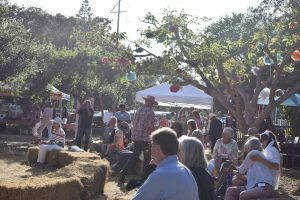 Join us for a Bohemian-inspired gathering to honor Castro Adobe stewards from the past and celebrate recent progress toward opening the Castro Adobe State Historic Park at Boho Castro, the fourth annual stewardship event at Castro Adobe. Get tickets. 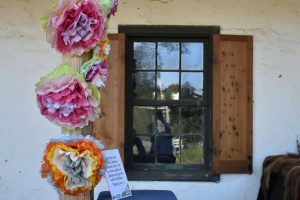 Step back into the 1960s at the Castro Adobe, a time when the Jowers family owned and cared for the property. Relive the Jowers’ good times, when an eclectic ensemble of their artistic friends made the Castro Adobe a Bohemian center of arts and culture. We’re honored to be joined at Boho Castro by Victor and Sidney’s children, Laura and Andrew. 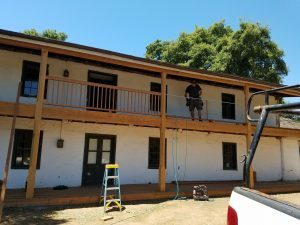 Work continues to restore the historic Castro Adobe. 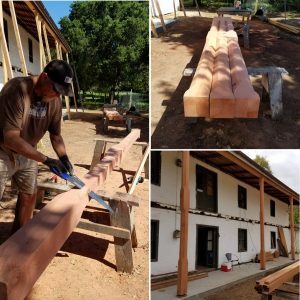 In April, the columns for the east façade were crafted by contractor Brian Bogaard. Sizing of the columns and cut of the chamfers were painstakingly researched to ensure they matched the original columns. Brian’s expert craftsmanship really shows on each carefully cut column. The columns have been carefully inserted and are awaiting final installation. 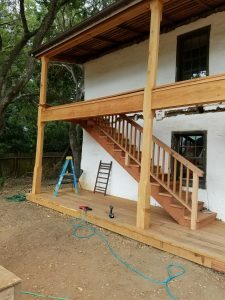 The next phase of work includes the beginning installation of the balcony.